I can’t think of a single person who eats meat that doesn’t like bacon. Nowadays it turns up in the most unlikely places, too. I have used it in meatloaf and in making bacon vodka. One of the more recent fads is to candy it, including dipping in chocolate, and use it in desserts. For my part I have a bacon, cream cheese and cheddar cheesecake recipe I’m sitting on, just waiting for the right time to make it. Bacon is literally everywhere. We put it on Caesar salads, in cornbread, wrapped around scallops, with eggs for breakfast and in the ubiquitous BLT sandwich. That's just the tip of the iceberg. Tasty stuff, it is. One of the common summertime uses is on top of burgers, hot dogs or sausages from the BBQ. But what if it wasn’t on top, but in the sausage? It would certainly save a step, wouldn’t it. That’s where this recipe comes in. This is for those of us who really love their bacon. Usually moisture is introduced to pork sausage either by the fat that is in whatever cut of meat you’re grinding, or by the addition of fat back. Not enough fat gives you a dry, dry sausage. You can use bacon for an added “cured” flavour. I often do. This recipe is slightly more than 1/3 bacon. Not for the diet-conscious I would venture. I used naturally smoked bacon, and also added a little liquid smoke to boost the smokiness in the regular pork. Yes, health-conscious readers, these are full of bacon. Just don’t eat 6. Remember, everything in moderation – including moderation. There’s two ways to make this sausage, with or without nitrites. Sodium nitrite, AKA pickling salt or pink salt, is a preservative that inhibits the growth of bacteria on meat. It also maintains the pink colour. If you do use it, the sausages will probably last 2 weeks just refrigerated. This is good if there’s only two of you, like us, since this recipe makes between 10-12 links. 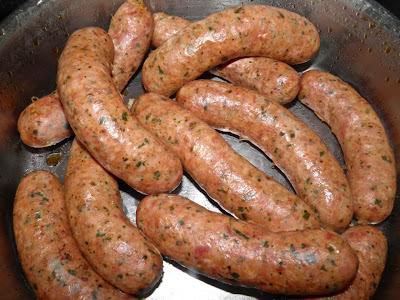 I usually boil sausage that has nitrites in the mix to pre-cook them as well, just for added safety. In Halifax, you can get sodium nitrite from Brothers Meats on Agricola Street. Ask for "pickling salt" for sausage making. They sell it by however much you want. A little goes a long way. They have a huge container of it out back. If you don’t like nitrites you can omit. The colour will be different and the sausage won’t last as long. But if you’re barbecuing right away for a bacon-lovin’ crowd there’s no need. 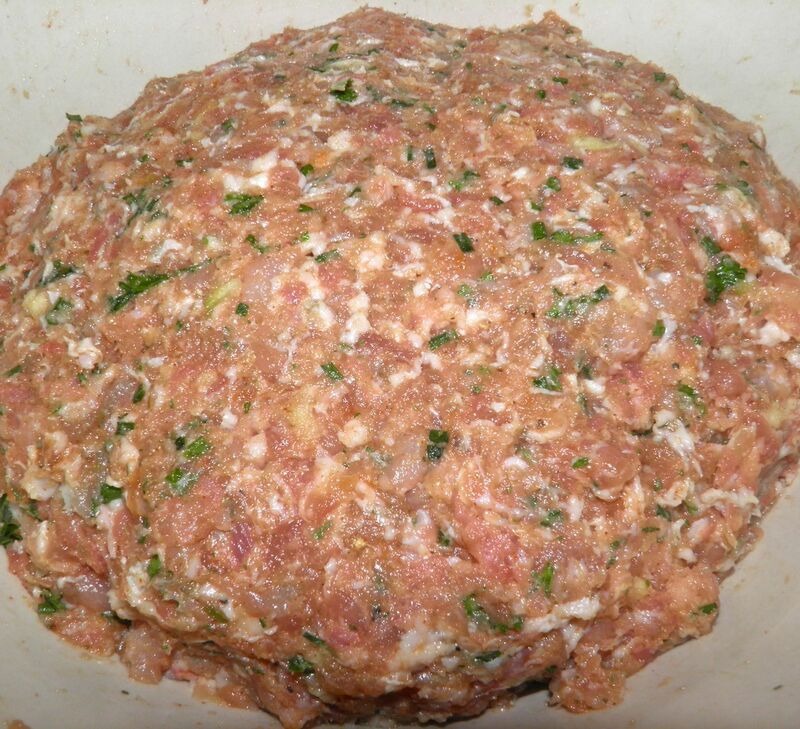 Just mix, stuff (or shape into patties) and heat up the BBQ. My life just got more interesting this week. We finally sprung for a BBQ. We got rid of our old one when we moved to the country and have been “relying on the kindness of strangers” ever since. But no more. It won’t take me long to figure out how to smoke meat in the thing as well. Then life will get really interesting. Use "fresh" as above, or parboil if saving for future use. 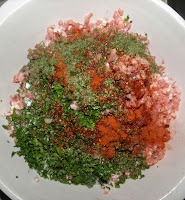 Grind the bacon and pork into a large bowl using the coarse plate on your grinder. Press through the garlic as you do the meat. Add the remaining ingredients and mix well. Wrap with plastic wrap and refrigerate overnight so the flavours meld. Alternatively allow it to sit on the counter for 1 hour, but no longer, before stuffing. Stuff the meat into casings and twist into links, or use loose as patties. If using the nitrite to extend the shelf life (see asterisk below), simmer the sausage in enough water to cover for 30 minutes. Drain and refrigerate, or freeze. The sausages will be drier if boiled, because a lot of the fat comes out during the process. * If using the sausage right away, or within a day or two, you can omit the sodium nitrite. 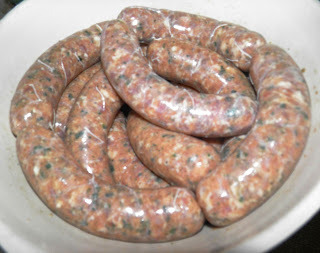 If using, the nitrite allows the sausage to stay safely in the refrigerator for up to 2 weeks. Sodium nitrite inhibits bacterial growth. This recipe looks delish! Could you just make the links then freeze for later use to grill or pan fry? You can freeze them for later use very easily. If grilling (any sausage) use the 'slow and low" method. Low heat, so they don't burst and leak fat which will cause flare-ups. Is the parsley and chives used in the dried form or fresh green? Any recipes for chicken sausage please? I have developed a recipe for a southwest chicken sausage. I'll share it if interested. Can this be made as fresh sausage omitting the use of cure? It would be kept in the deep freeze?